Papercrafts by Patti: This Too Shall Pass and Fabric Frenzy! This Too Shall Pass and Fabric Frenzy! Hello! Happy Monday. I'm jazzed again with another beautiful Designer Build A Brad, this time using a teeny circle of flowers cut from a print in the Twitterpated Designer Series Paper. It's a perfect bouquet to fit onto the brad! I love the sparkle these blogs of plastic give off! (I'm sure there is a proper name for the plastic bubbles, but it escapes me! Thanks for visiting today! I hope your week is fantastic. Won't you let me know how you like my card? I love to read your kind comments. Starting today through March 31st, (while supplies last), all Stampin' Up! Fabric is HALF OFF!! Seamstress or not, you will love using this high quality designer fabric that coordinates with Stampin' Up's papers and other products. Available in extra-wide fat quarters (18" x 26"). 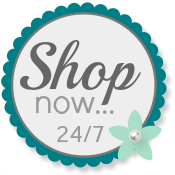 When you need to order Stampin' Up! supplies, please use my Online Store. Wow! This is card is a beauty, Patti! You have a knack for using the designer brads on just the right cards in just the right places. wow, what a fancy card! !